The Vector Lite modular display system is ideal for smaller-style venue exhibitions such as hotels and small halls. It’s also great for educational or training environments as well as reception areas or museums. 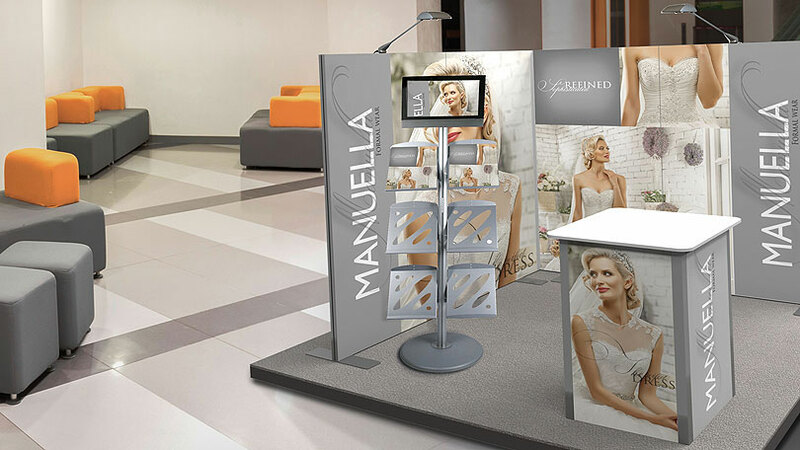 Design, customise and build your very own unique exhibition stand using Vector Lite – an aluminium frame-system that is able to support almost any type of media using one cleverly-designed channel. Assembly is quick and easy. Simply connect the mitred frame lengths together using a corner cleat. The corner cleat is secured in place by tightening grub screws with an Allen key (supplied). Frames are available in various widths in both straight and curved formats, allowing you to create endless configurations. Frames can be stacked on top of each other to reach heights up to a maximum of 2000mm (depending on configuration). Frames can also be effortlessly joined side-by-side due to a joining hook that allows panels to simply slide together. Larger frames are supplied with a support brace that fits between the two vertical frame sides, this ensures the frame remains strong and sturdy. Complete your exhibition stand with graphics printed onto a wide choice of materials including foam-board, PVC or textile fabric. The foam-board and PVC can be attached onto the frame using magnetic tape or hook and loop fastener and the textile graphic uses silicone edge gasket (SEG). Frames can have front and back graphics attached if required. This video shows how easy it is to build your exhibition stand using the Vector Lite System. For free, impartial advice or to see if Vector Lite modular display system is the right solution for you, give us a call on 01782 525500.